I love museums, specifically art museums. My son has been really into the Mona Lisa and Birth of Venus since I bought him the first book in the reviews at the Vancouver Art Gallery. He also keeps asking to go to the Louvre after seeing an episode of Little Einsteins, don’t I wish! 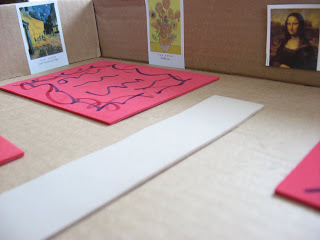 So while he was napping on Sunday I made him a museum, kids could be a part of this for sure – instead of using masterpiece stickers you could make your own art! It’s been played with multiple times since making it . Gather your materials. 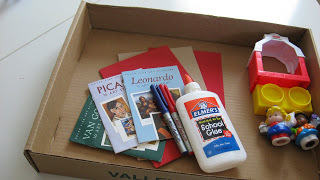 You will need a shallow card board box, some foam or construction paper in 2 colors, some markers, glue, scissors, art stickers, little people blocks and little people. Start by cutting your foam into rugs. 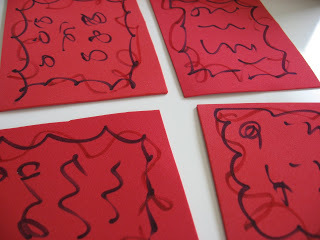 Draw some fun squiggles to make the foam look like oriental rugs. 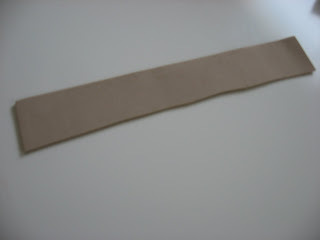 Cut a runner from the other color of foam. Time to add stickers- here is a close up of the stickers we are using. I found them at the St. Louis Art Museum ages ago but have seen them at the Vancouver Art Gallery . Add them to your box. The Mona Lisa is from the cover, I’d already used the sticker, I just taped it on. Add the furniture- I used a few blocks. Add your doorway. My son has been saying “Please pay for museum here” when he plays. If you have time you could make a little desk! 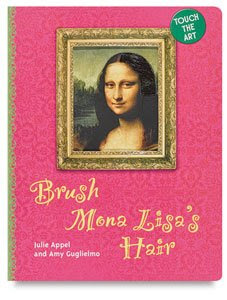 “Brush Mona Lisa’s Hair” by Julie Appel and Amy Guglielmo is the inspiration for this post and my son’s new found love of Renaissance Art. The book is a board book with touch and feel aspects to it. The text is cute but not a story, each page asks the reader to do something with the touch and feel item . The real gem is bringing the art to young eyes. 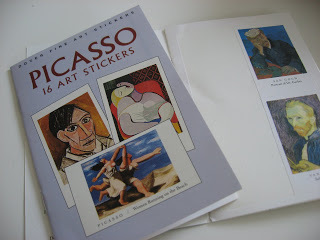 The book includes wonderful masterpieces : Girl with A Pearl Earing , Birth of Venus, The Arnolfini Portrait and more! 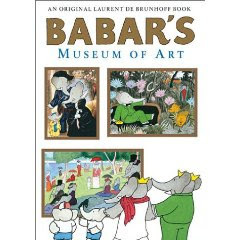 “Babar’s Museum of Art” by Laurent de Brunhoff is one of my favorite art books for kids. My son has recently decided he hates it because he doesn’t want to see the elephant versions of the art. All the art in the museum are masterpieces that you will recognize redone with elephants. He slams the page in the way only toddlers with a definite sense of justice can and says ” No elephant paintings Mama, real ones!” Trust me though this book is awesome and he loved it a few months ago. The story is about how Queen Celeste wants to change the abandoned railway station into a museum to house all their collected art . The museum itself looks just like the Musee D’Orsay in Paris and the story also explains art for children. 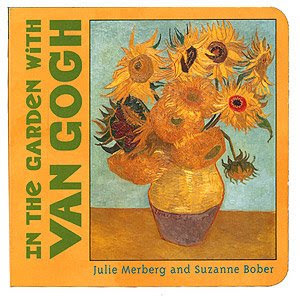 “In The Garden With Van Gogh“ by Julie Merberg and Suzanne Bober is a little board book filled with easy rhymes and great art. The book doesn’t really have a story so much as a theme but it works. My son enjoyed it and asked to read it again after we were done. I like that books likes all these bring art into little hands for them to explore. 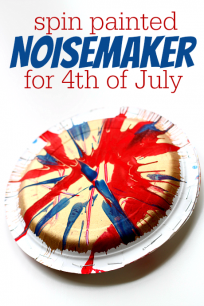 Previous Post: 4th of July ! Holy crap, this is seriously brilliant!! As an art lover & collector, I really want my 2 1/2 yr old to love and appreciate art like I do. We are so trying this & I'm on a hunt for those books, too! Very Cool! I'm sure he will get a lot of pretend play out of it. What a great idea! I'll have to find some stickers. An idea we got from DS's school is to have a picture frame at his eye level with art postcards in it and then switch postcards every now and then. A couple other museum books we like are "Art of shapes" and "Museum ABC". This is so INCREDIBLE! 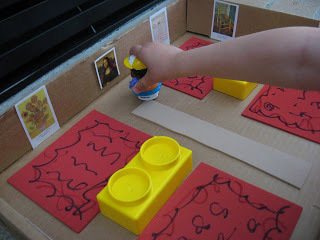 I thought about making a mini museum and use small photos of my kiddos art work. 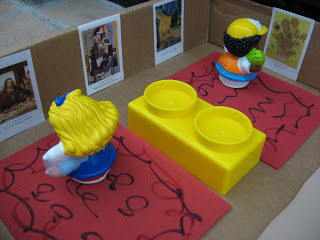 I love how you used the books— such a fantastic and FUN way to learn about art appreciation! This is so cute – what a great idea! This is so great! We are really into the book, Olivia, right now and she likes to visit the museum too! My daughter would love this. She enjoyed the museum when we went. Seriously, so clever! YOu come up with the best ideas! Another great series for fine art is the one by James Mayhew. I love his book, Katie and the Mona Lisa. Katie is in a museum and interacts with the paintings. It makes the works of art come to life! That is way too cute! I bet my 4-year-old would love it. In fact, I might even have all the materials kicking around. I majored in Art History. I'm going to make this for myself! Put all my favorite paintings in one museum room! BTW, I LOVE all those kid-art books. I have lots of them! 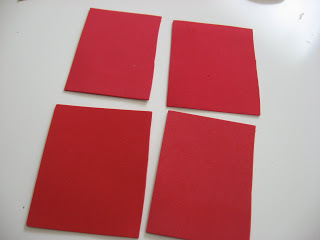 Thanks guys- I was planning on only posting Canada Day/ 4th of July crafts but had to share this one . Something Girlie- I can't wait to check out those books, thanks you!! 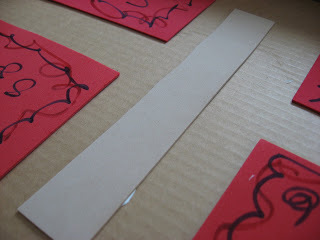 This will be great to do before we take the kids to the National Gallery!! thanks! 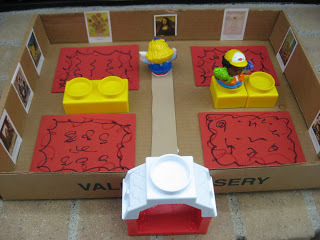 What a cute idea — I loved making little houses and cities when I was little. This would have been right up my alley! How fun! These little books are available on Amazon.com for $1.50, and if you buy four, one of them is free. I just happened to be placing an order today, so I added four of these little books to my list. Lucky timing! I'm thinking about putting the stickers on some stiff paper or cereal box, laminating them, and putting velcro on the back. Then my kids can change the display in the gallery as they play with it. 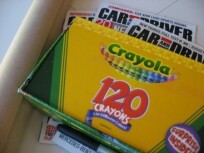 kingstonmama – what an awesome idea, and thanks for sharing that they are on sale. Andrea- very cute! Love how the markers showed up on the black , super cute! These are great book suggestions. I love art and hopefully instilling art appreciation in my children. Great post. oh my goodness!!! 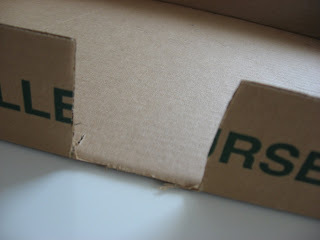 I love this and am totally going to try and put it together! This is one of the cutest things EVER! I love it! 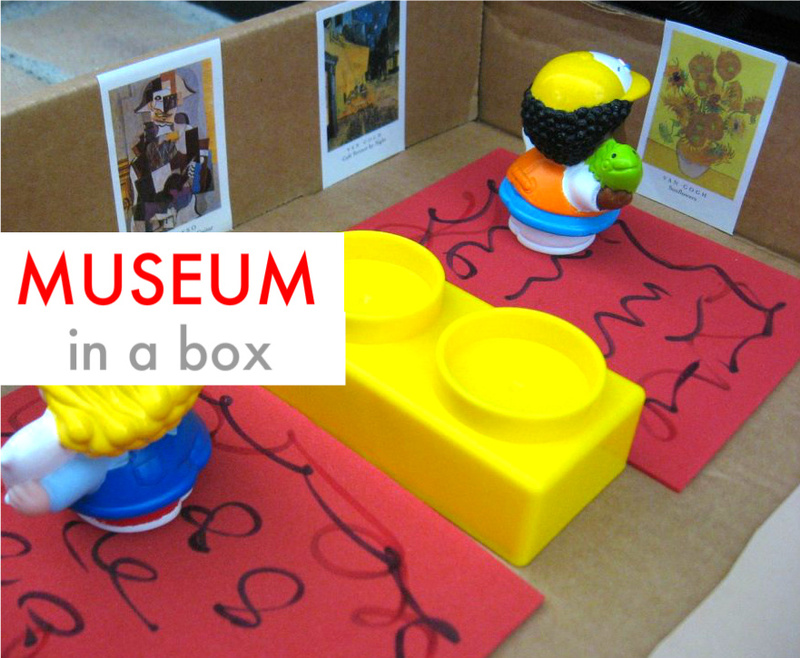 I’m loving this mini museum! My youngest daughter would love this for her Littlest Pet Shops. .-= Jen´s last blog ..Martha Speaks Read Aloud Book Club =-.